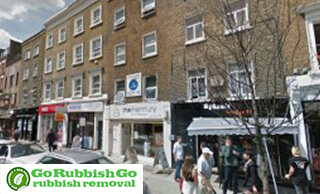 Would you like waste removal carried out for your property in Fitzrovia? Allow Go Rubbish Go to help you now and we promise we will not let you down for a second. If you need professional help, you can absolutely rely on us anytime you like. We won’t leave you disappointed in us; we can assure you of that. We can help you 100% with rubbish clearance W1 whenever you need it, so don’t hesitate to get in touch with our office staff today if you would like your rubbish bags gone for good. Our rubbish removal services offer amazing value for money so now there aren’t any excuses why you can’t hire us if you need help with W1 waste clearance. You can depend on us 100% and you won’t have to worry about the end bill because our services, we can assure you, are highly inexpensive and affordable to everyone. We are sure our services will be well within your budget. The main reason so many people avoid using companies like us is price. But we want you to know that with our great deals, you no longer have to worry about how much it’s going to cost you. Don’t hesitate to get in touch with our office today on 020 8610 9182 to find out more and treat yourself to an incredible waste removal in W1, Fitzrovia. We Can Help With Business Waste! Hire Our W1 Rubbish Disposal Service And See For Yourself! There are many ways in which we can help with your business waste, however, some of our most popular services in Fitzrovia include removing of general waste, confidential waste and specialist waste clearance. Our general waste removal includes the disposal of all sorts of everyday waste and is a competitive alternative to inflexible council provisions. Our waste disposal Fitzrovia, W1 is also a popular option with businesses in the local area and can help with the safe disposal of office equipment, private contracts, letters and other business papers. Our specialist services are also known for being professional and reliable and can include the removal of electrical items, machinery and other bulky and heavy items. So if you are looking for solutions to your business waste, call Go Rubbish Go on 020 8610 9182 to get a quote today! Flawless waste collection service in Fitzrovia! I was very impressed with the great way this company arranged everything for me. I got a team of professionals to come to W1 and deal with all of the rubbish in my home! Very reliable and responsible company! Today, everybody is becoming more aware of the damage they are causing to the environment through their everyday actions. The way you eat, the things you buy and literally the way you live affects the environment. So it is vital that you follow an eco-friendly lifestyle if you want a healthy planet and a healthy you! 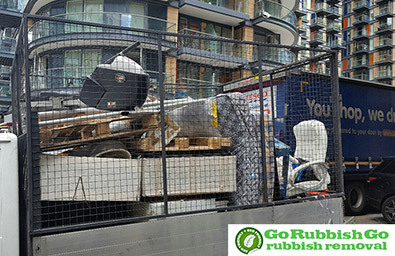 We provide the most eco-conscious Fitzrovia rubbish removal services. When we carry out a service, it will be greener than ever. Firstly, we make sure we take the right sized vehicle to save back and forth trips when picking up your rubbish. And we also try to recycle anything you want cleared. Waste is a big part of the planet’s problems. You need to try and put your rubbish to good use, mainly through recycling it. Let us help with waste collection Fitzrovia and see the great results we can achieve. You won’t have any regrets when you use our team of rubbish removal professionals. They know what they are doing and won’t, even for a second, let you down. See what we are capable of – we will make your rubbish vanish in next to no time at all! You receive a money back guarantee on top of everything else! You are guaranteed a top quality service at a low price. So what are you waiting for? The benefits to booking with us for Fitzrovia rubbish disposal go on and on. Call 020 8610 9182 now and see for yourself! Fitzrovia is a district which is part of both the London Borough of Camden and the City of Westminster. It is located in central London. The area is considered to be very attractive because of its mixed-use of retail, education, healthcare, residential and business activities. One of the most famous streets in Fitzrovia is the Charlotte Street which offers lots of attractions and places for entertainment. The area is named after the Fitzroy Tavern which a public house situated on Charlotte Street. Fitzrovia bears the W1 and WC1 postcodes. Neighbouring areas include Somers Town, St John’s Wood, Soho, Bloomsbury and Marylebone.